For the next couple of months I wont be putting up any new posts in order to focus on the role I have recently accepted at Wolff Coffee Roasters here in Brisbane. I will still post periodic updates from facebook, twitter and google+ below are the links to all of bne coffee’s social networking channels. Beanhunter.com finally releases its app on android!! So for the past 2 years I have been hassling the boys at beanhunter.com to release an android version of the famous beanhunter app to the android market. And finally after all this waiting and thinking it might never happen I get word a few weeks back that its actually in development. It was great news to say the least. Today I am very happy to report to you that the app is now live on the android market and is free to download! My Christmas has come early! You can download the app directly from the beanhunter website >> www.beanhunter.com/android or directly from the android market on your phone. Click here for the link to the android market.If your unfamiliar with this app let me tell you it is a life saver when you are travelling and you don’t know where the good coffee spots are. 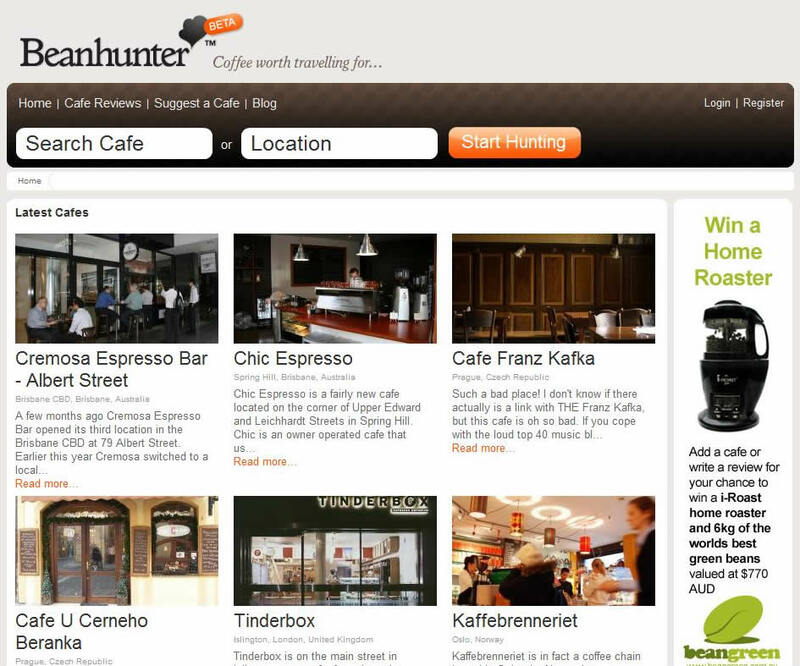 Of course its not fool proof as your relying on the opinions of others but once you get used to the way beanhunter works you will quickly learn how to spot what I call are the “one hit wonder” reviews .. those are the reviews where the owner of a cafe gets on beanhunter and gives himself a perfect 10 for his own cafe .. they never submit another review they simply joined to list there own cafe. The boys at beanhunter are usually pretty quick to remove these reviews as well so most of the time you will get genuine reviews.So if you are in a foreign city or simply in a part of your own city you don’t normally go to simply pull out your phone click on the app then click on the “Near Me” button and it will give you a list of the cafe’s closest to you using your phones GPS signal. Once you’ve found a cafe you want to check out click on the map icon in the top right corner of the app and it will give the option to launch google maps which will then give you directions to the cafe. Since migrating from iOS to android 2 years ago this was the one app I was really missing .. my phone is now complete. I predict this will quickly become one of the top free apps on the android market very quickly. I really love this app .. I only wish I would’ve thought of it myself. And it comes at a perfect time as I will soon be driving down the East coast of Australia from Brisbane to Sydney .. I am sure this app will come in very handy when it comes time to find the good coffee while on the road. For the past decade my coffee journey has developed and grown into a passion. So much so that over the past few years a few things have happened to make me take stock of whats important in life. After some encouragement from a few friends in the Brisbane coffee scene I have begun my cross over into the world of the barista. I started this blog because I wanted to highlight the cafes and specialty coffee shops that are really passionate about coffee. Its only been a few weeks since I started my learning process at a friends cafe but I am quickly seeing a whole new side to what it means to make a quality cup of coffee. As I learn the key elements that go into making a coffee, from the dosing, watching the pour and milk techniques I am gaining a whole new perspective from the other side of the machine that is giving me an even greater insight into what it means to make a great cup of coffee. I’ve always had high standards for what I consider is a great cup of coffee and now I have to channel those standards into my own coffee and I am loving every minute of it. Although it can be frustrating at times I love the learning process and the satisfaction you get when you get something right. I’ve had the pleasure of drinking many of Mecca Espresso’s single origins via the second grinder at One Drop Specialty Coffee so I already had high expectations when I heard Pourboy Espresso was going to be the first espresso bar in Brisbane to be using Mecca Espresso beans and my expectations were most certainly met. Pourboy serves up a mecca house blend consisting of Ethiopian boldgrain 34% Ethiopian Sidamo OCR 33% and Costa Rica Don Jose washed 33% which is known as the dark horse blend. In the second grinder they serve up various single origins via mecca. At the time of this review they were pouring a very smooth and chocolaty Guatemalan which I had in a picollo and was very impressed. 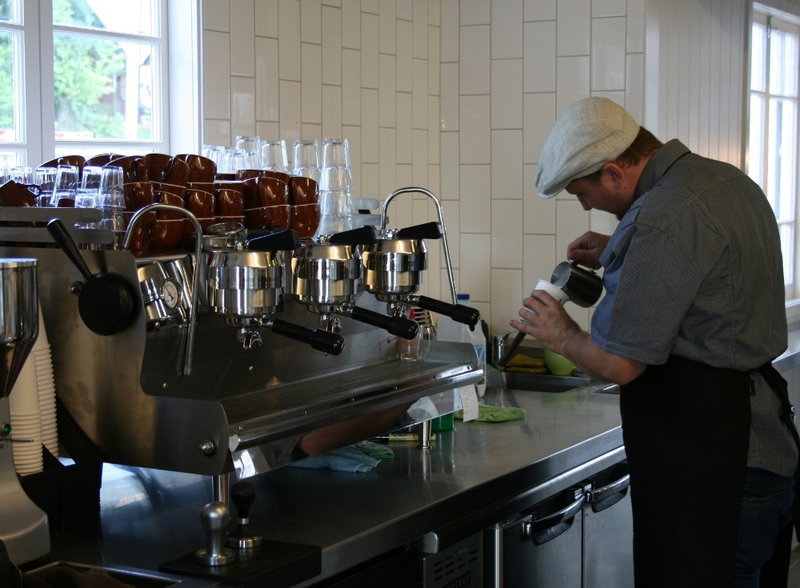 The staff are very friendly and the owners are very passionate about coffee which is of course a key criteria for any serious espresso bar / specialty coffee shop. 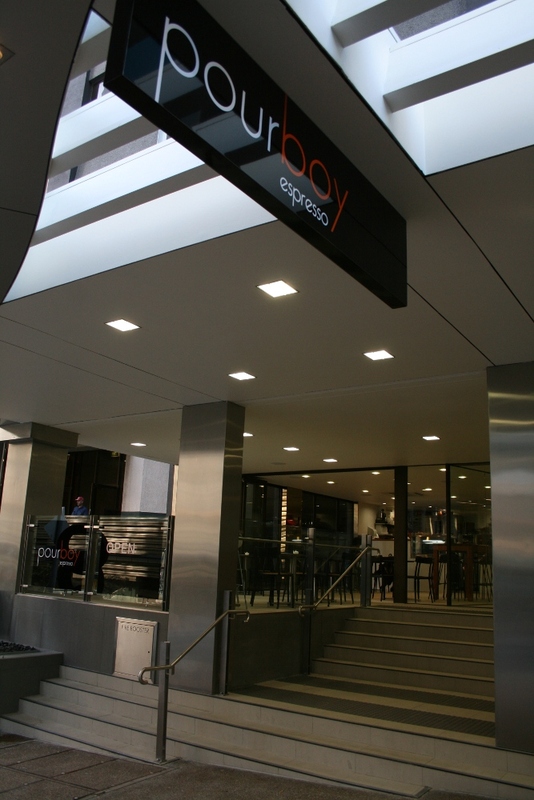 The Brisbane CBD has been in dire need of a new cafe that serves up a bean like Mecca’s and I can easily predict that Pourboy will quickly become on of the CBD’s top hot spots within a matter of weeks. 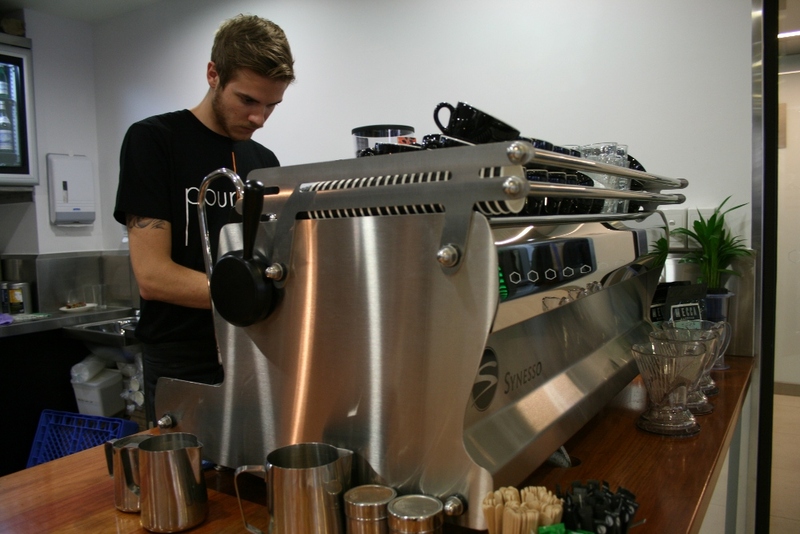 Have you been to Pourboy Espresso? Click on the discussion link below to tell us what you think. In the past year I have seen a few suburban cafes pop up but I have to say “The Corner Store Cafe” has just raised the bar a little higher in the suburban cafe race. They use locally roasted beans via Cleanskin Coffee Co. and are currently serving blend #7 as their house blend. I had a variety of coffee’s in the 3 hours I spent there and all of them we’re great. They have a great food menu that is one of the most affordable I have seen in a while so the value for money is great. 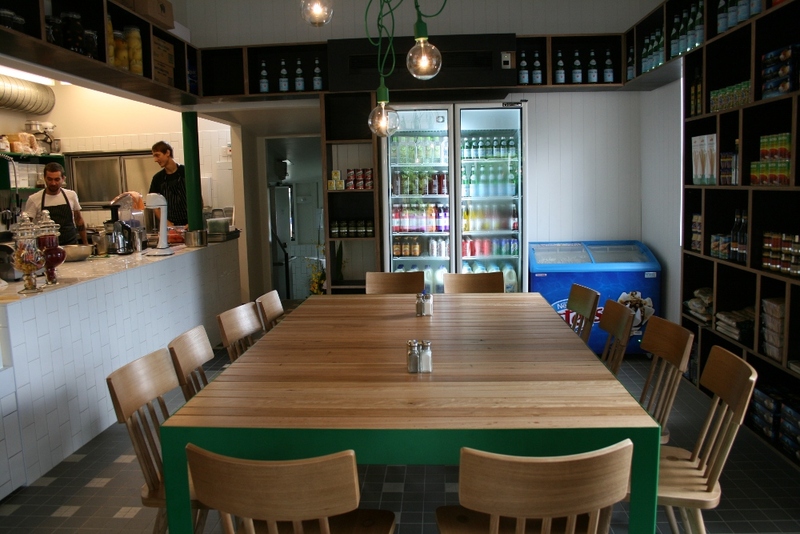 One of the interesting elements of this cafe is that it really is partially a corner store. You can go in and buy a 2 liter milk or a can of coke with your take away coffee as well as other items that are on the shelves all around you as you walk in the front door. The corner store element is so carefully blended into the cafe element that you barely notice it at first which says to me they put a lot of time and energy into getting the cafe / corner store balance just right. On a personal note .. I love the fact that i can have a coke with my espresso at this cafe .. no other cafe I’ve reviewed allows you to buy a good old can of coke with your coffee. On my second day spending some time at this cafe they were just putting the finishing touches on a very large modern outdoor area. 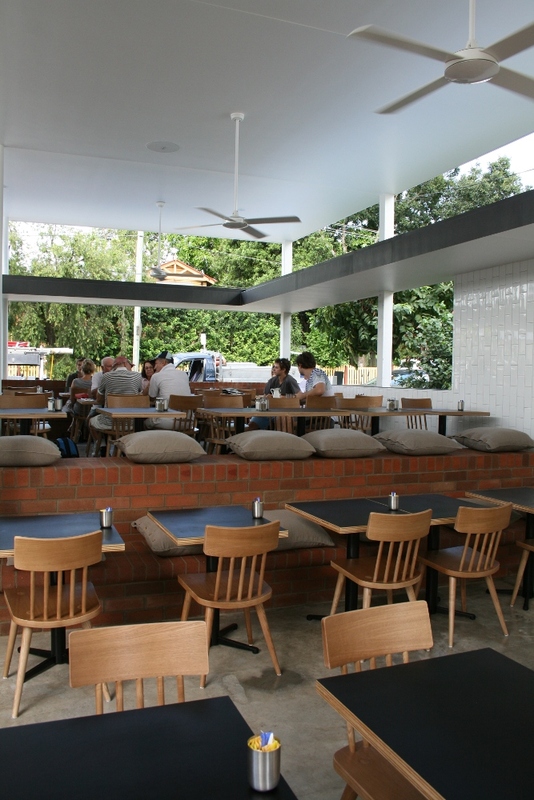 At first glance this cafes size is deceiving but it actually seats 120 people which I do believe makes it the largest suburban cafe in Brisbane. 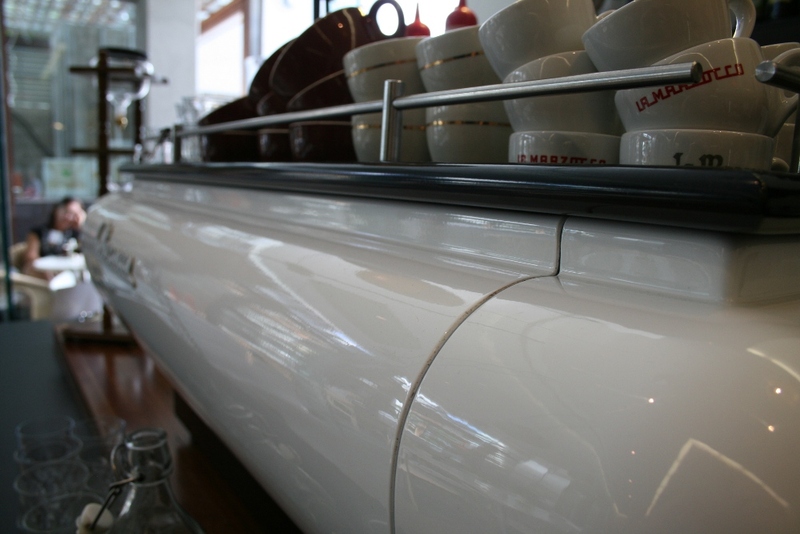 I was very impressed with the attention to detail in the fittings of this cafe. When you go, make sure you have a good look around. The sliding doors to the outdoor area look like shelves on a glass wall which I thought was very innovative. 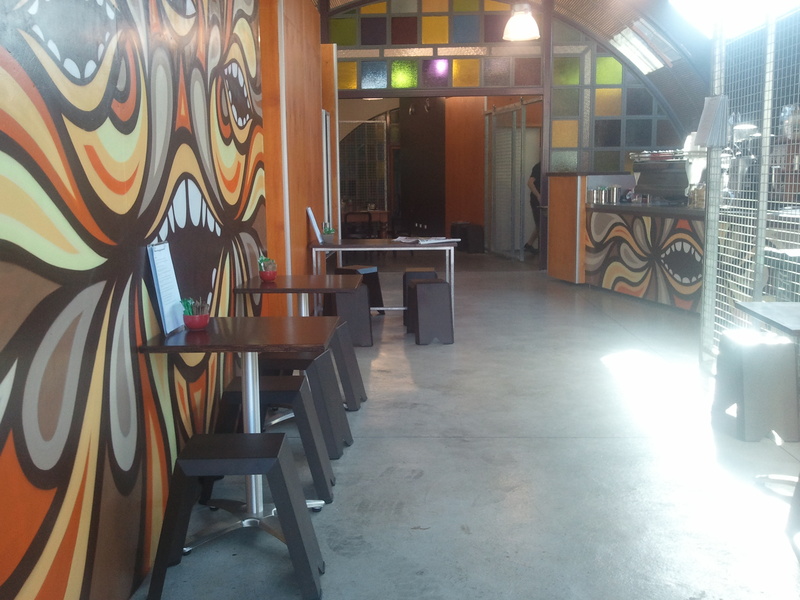 I added a few more photos then normal so you could get a good idea of how big this cafe is. I have uploaded even more pics to our facebook page. You can view the album here http://www.facebook.com/album.php?aid=288910&l=5ec2ddaeaf&id=141541834576. This is a great edition to the Brisbane coffee scene and I can easily predict that it will become a very popular spot for locals and coffee geeks alike. As a matter of fact, on my second day at this cafe they were getting absolutly slammed with customers which isn’t bad considering they have only been open for a week. 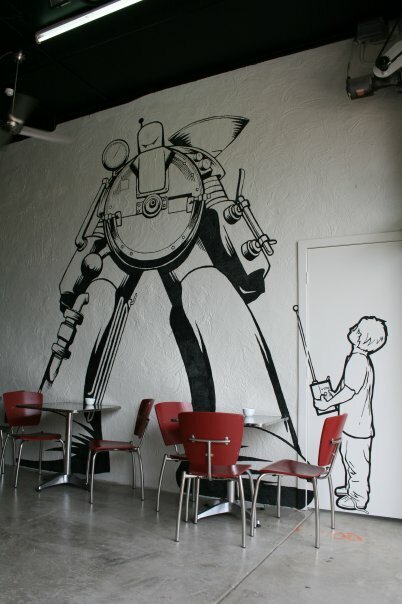 So make sure you put this on your list of cafes to check out. 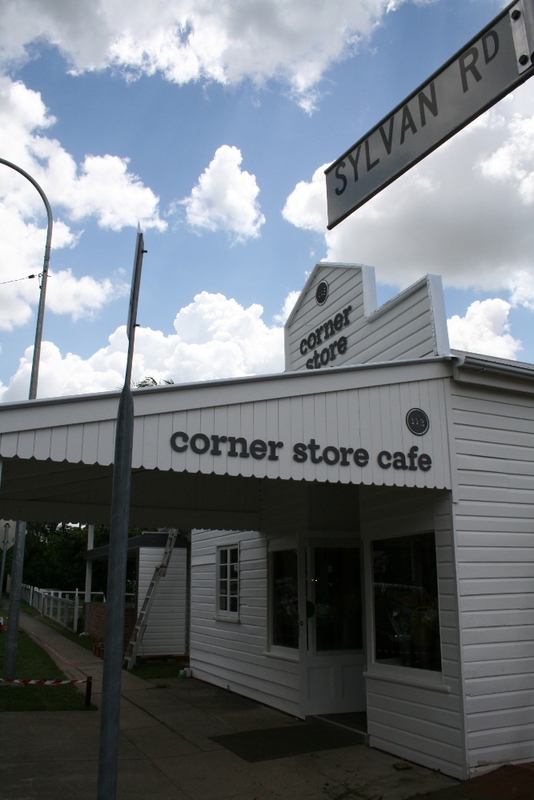 Have you been to The Corner Store Cafe? Join in on the discussion and tell us what you think. Facebook and twitter pages are in the works and I will post links as soon as they are online. 😉 In the mean time you can direct your tweets to @barista_kane as he is the man behind the Synesso! Hello my fellow espresso lovers! I have finally gotten around to implementing an update to BNE Coffee that I have been meaning to do for a while now. I have talked through many idea’s on how to make the site more interactive and I have added discussion threads to every article. These discussion threads are linked to the BNE Coffee facebook page so anyone who is a fan of our page can take part in the discussions. Its a way for the readers to get involved and give feedback from a different perspective other then mine. Ok so Varsity Lakes isn’t in Brisbane and I know that this blog is called “BNE Coffee” as in “Brisbane Coffee” but I had to make an exception for this new cafe in Varsity Lakes on the Gold Coast. Blackboard is owned by Nick Pearce and while I did not get the chance to meet him today I was assured by others in the coffee industry that he is an all around good guy. Not to mention his staff were very well trained, very friendly and very passionate about coffee. 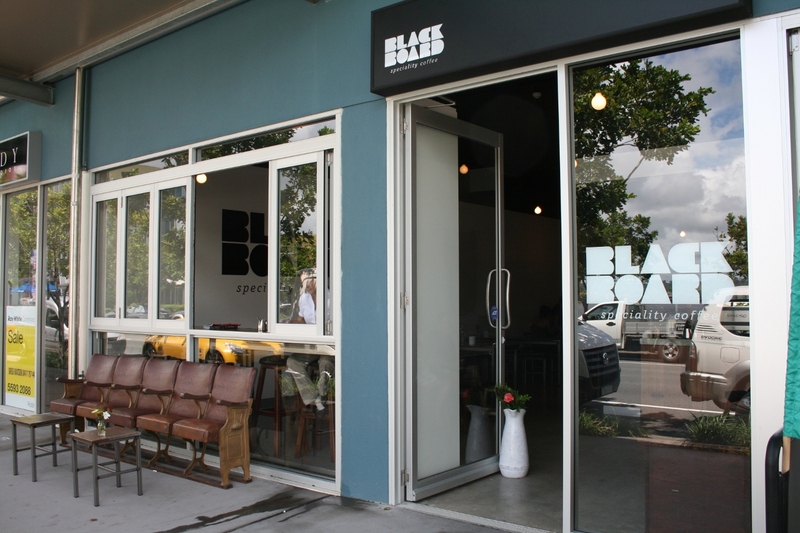 I may be corrected on this but the Gold Coast isn’t well known for its specialty coffee shops so when word started spreading about Blackboard a few months back I was very keen to check them out. Blackboard uses locally roasted beans from what I consider to be one of Brisbane’s most respected boutique coffee roasters “Cup Specialty Coffee” making the quality of the coffee at Blackboard exceptional. Like any self respecting specialty coffee house they run two roburs (grinders) to give you a choice of their house blend or a single origin. I had my standard double ristretto latte followed by a long black and both we’re well executed. The food was just as good as the coffee. I had a chicken and rocket toasted sandwich which was really good. What I found very cool about Blackboard was the vibe. You felt more like you were in Melbourne then on the Gold Coast. I am not sure if this was intentional in the design of the cafe or not but it works. 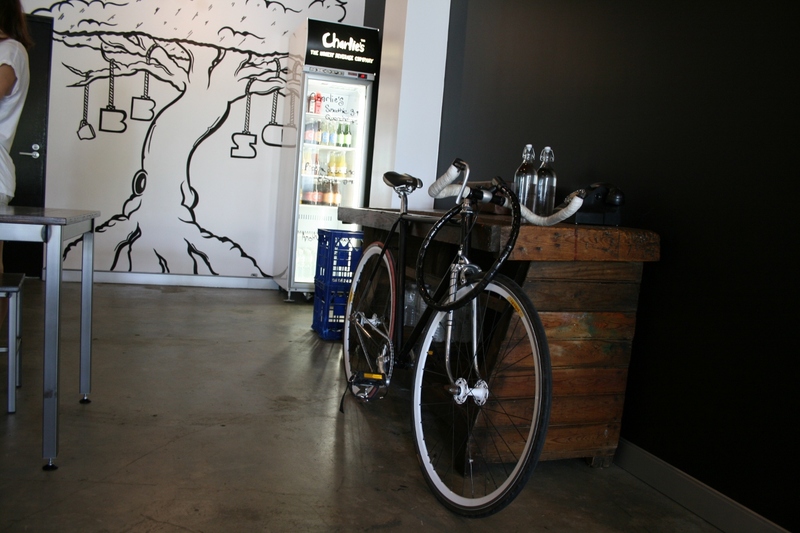 Blackboard has a very modern Melbourne type vibe. So much so that you’d almost expect to step out into a narrow lane way rather then a Gold Coast street as you leave. 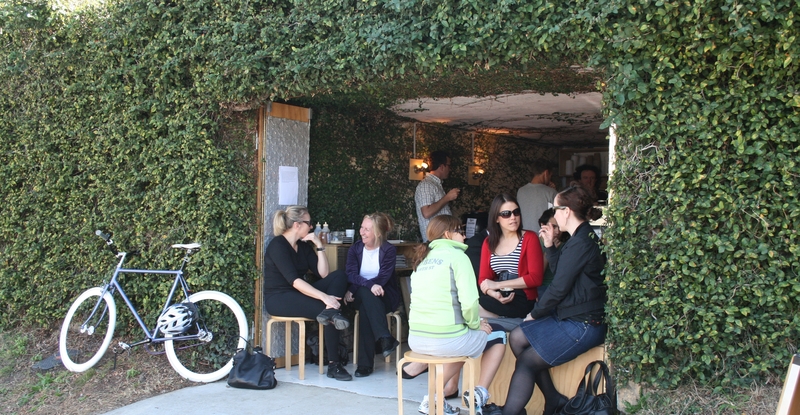 This cafe will most certainly put Varsity Lakes and the Gold Coast on the map for specialty coffee lovers. I highly recommend you stop in next time your on the Gold Coast. I’ll post more pics soon! 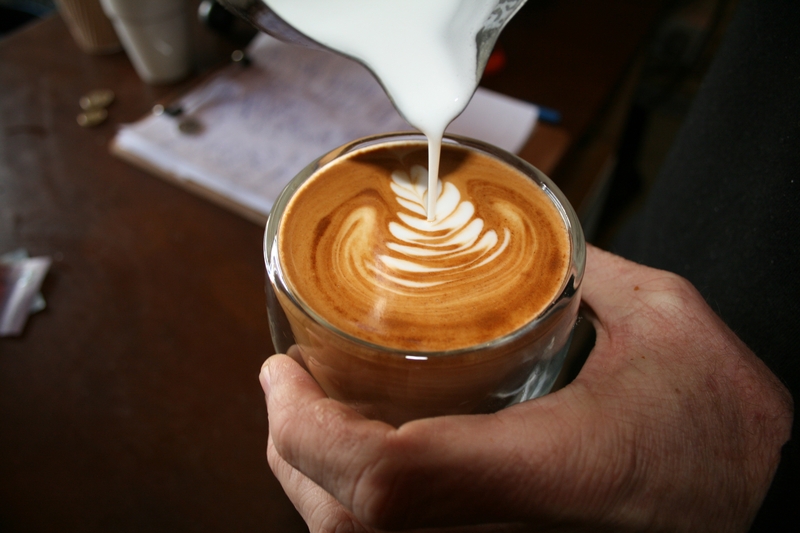 Have you been to Blackboard Specialty Coffee? Join in on the discussion and tell us what you think. Click on the link below. If your like me then you’ll agree that Dandelion & Driftwood is like Disneyland for coffee geeks. This cafe is different, it has an ultra modern vibe and the attention to detail is quite simply amazing. 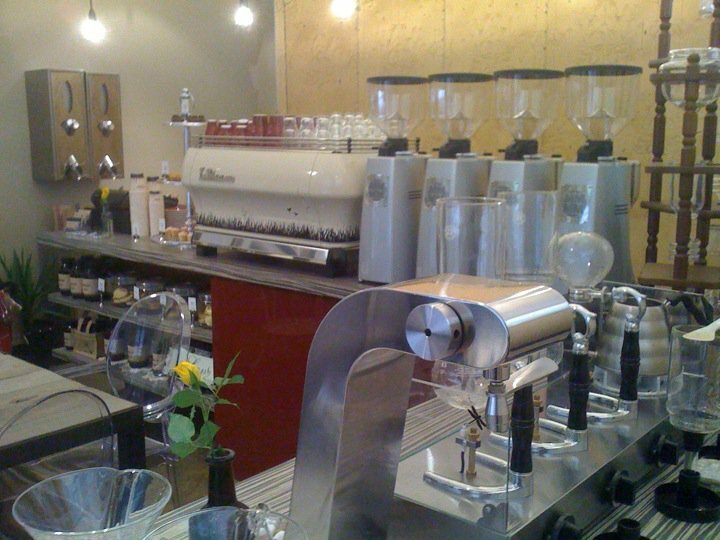 You’ll notice the four grinders sitting on the counter offering up four choices of coffee beans for you to try. There are two house blends, the first is called “Dandelion” and it is specifically blended to the appeal to your feminine side while the “Driftwood” blend is stronger and blended to appeal to your manly side. The other two grinders are reserved for single origins. All of which are roasted by Peter Wolff and his team at Wolff Coffee Roasters. 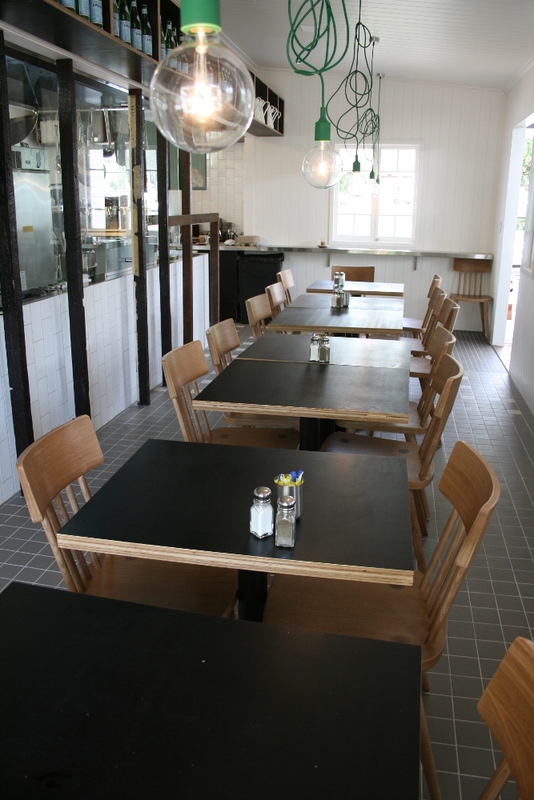 Have you been to Dandelion & Driftwood? Join in on the discussion and tell us what you think. You can follow the progress of Dandelion and Driftwood using the following links. 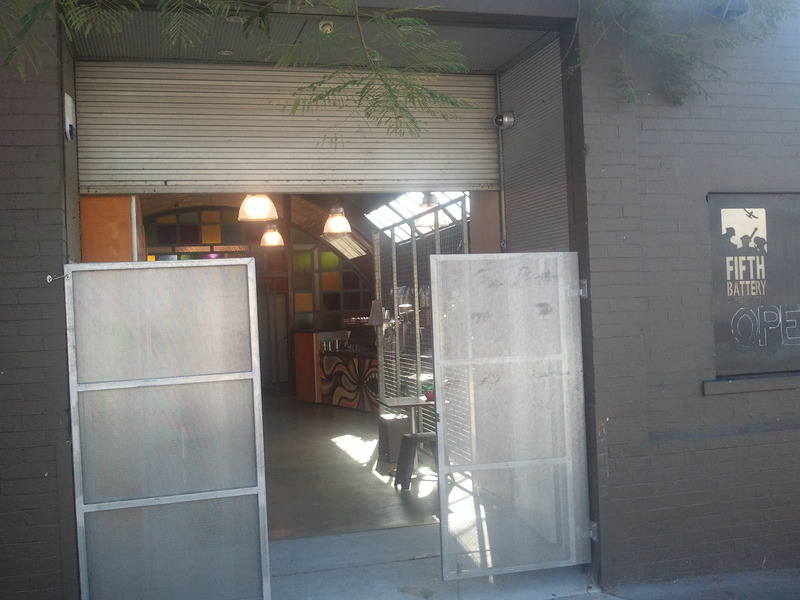 Fifth Battery Coffee Roasters is a brand spankin new cafe / roastery in Fortitude Valley. 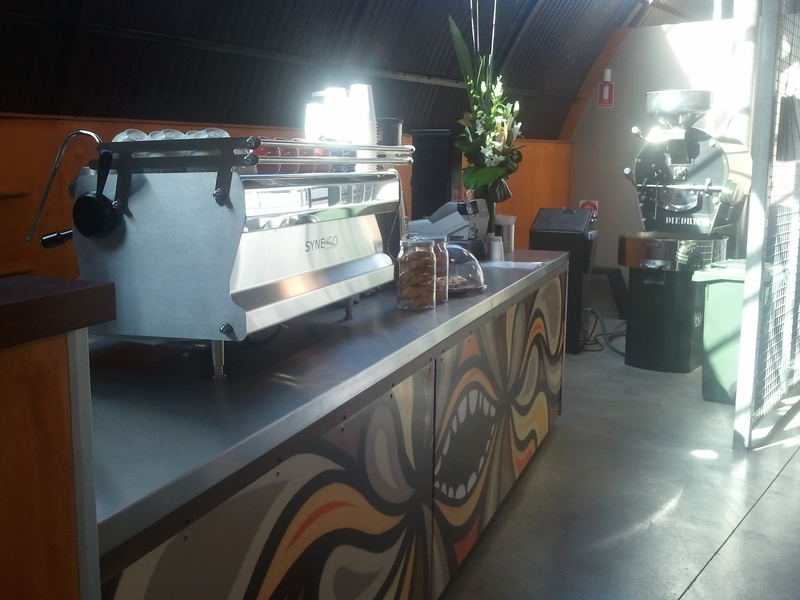 Its only been open a few days and while they are still in the early stages of roasting the coffee is pretty good. Stay tuned for the full review coming very soon. One thing I will say is that they have clearly put in a lot of hard yards turning this old hangar style building into one very cool looking cafe. 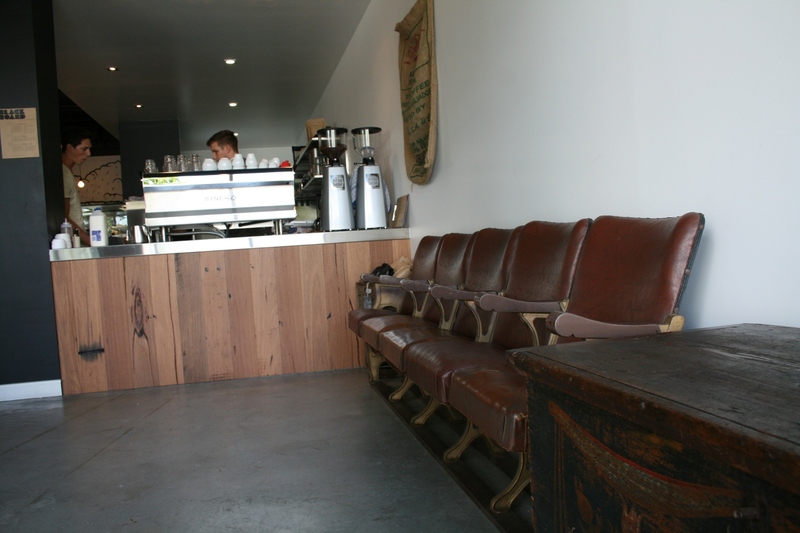 Have you been to Fifth Battery Coffee Roasters? Join in on the discussion and tell us what you think. 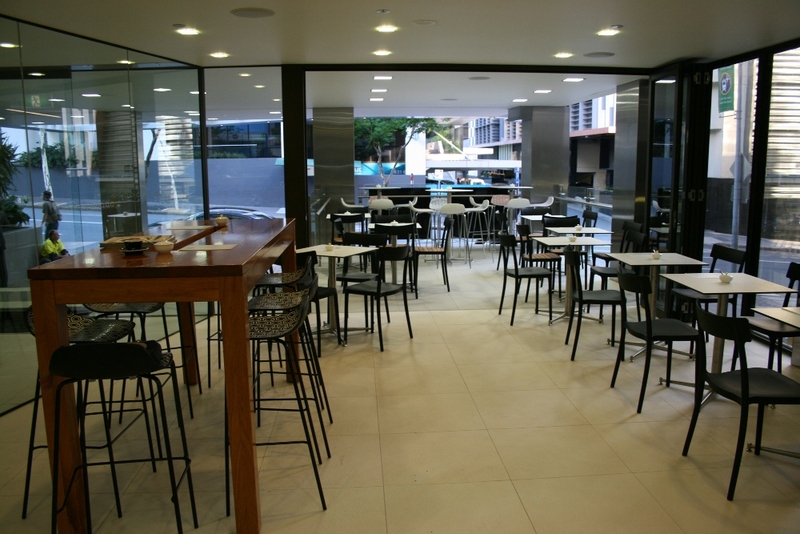 In Brisbane these days it is all about word of mouth when it comes to new cafes and all though I would like to think I am always on top of whats up and coming as far as new cafes in Brisbane this one slipped under my radar. 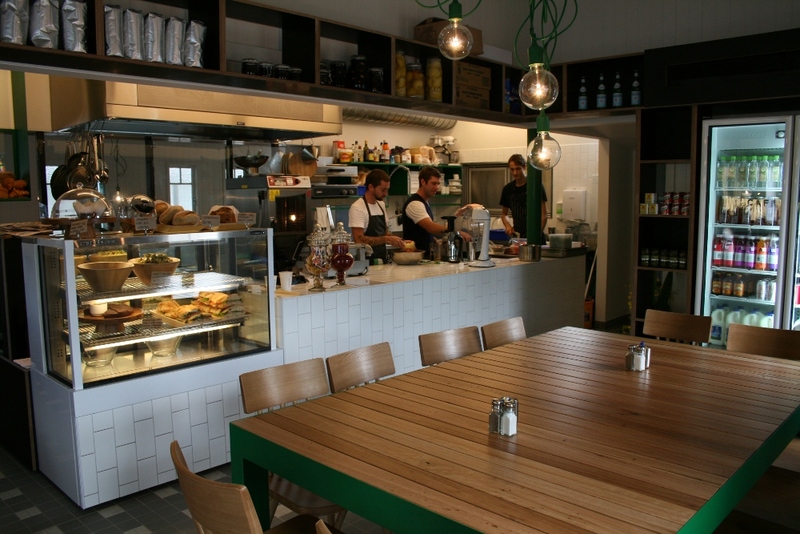 Bunker Coffee is a tiny hole in the wall cafe situated on Railway Terrace just a stones throw from the Milton train station. Bunker uses locally roasted beans from Blackstar Coffee in West End Brisbane so my expectations for a really good strong coffee we’re already peaked before I even walked into Bunker. Upon arriving I was greeted by very friendly staff who were quite happy to have a chat. My first coffee was a double shot latte and I was stunned at how different it tasted compared to the Blackstar I had tasted many times before at the Blackstar Roasting cafe in West End. It had the signature “kick you in the face” Blackstar strength but with a real smoothed out edge to it that made for what I consider to be an amazing coffee. 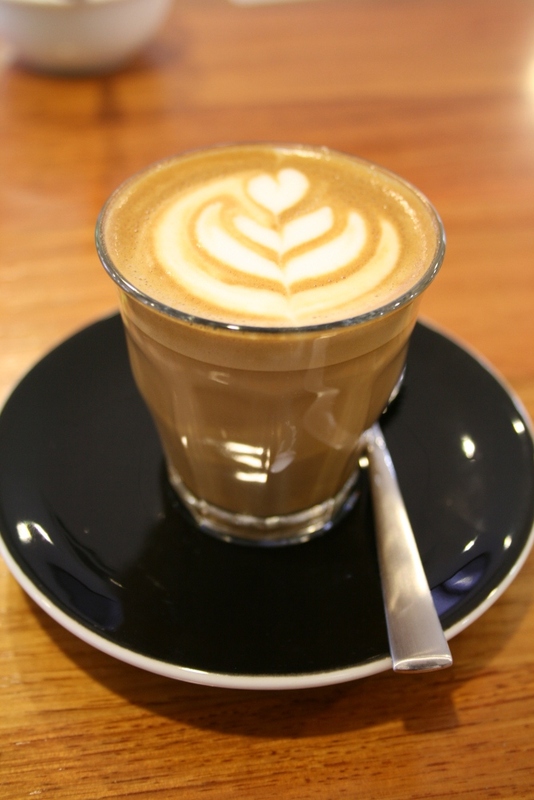 For a hole in the wall style cafe like Bunker to go from a weekend operation at the Kelvin Grove Markets to a cafe with coffee of this consistency and quality is a major accomplishment and the coffee is so good it ranks in my opinion as one of the best coffees in Brisbane. Bunker is located in what used to be the garage for a house at 21 Railway Terrace in Milton. 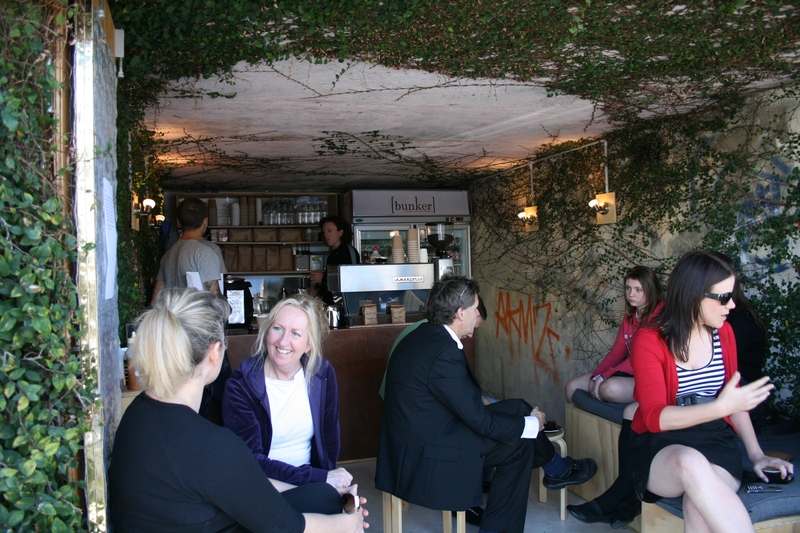 The atmosphere is very “Bunker” like with the vines growing on the outside and inside walls making for a unique place to have a coffee. All though Bunker has only been opened for a month or so now it is quickly becoming a hot spot for coffee in the Milton area which until now was seriously lacking a decent specialty coffee shop. 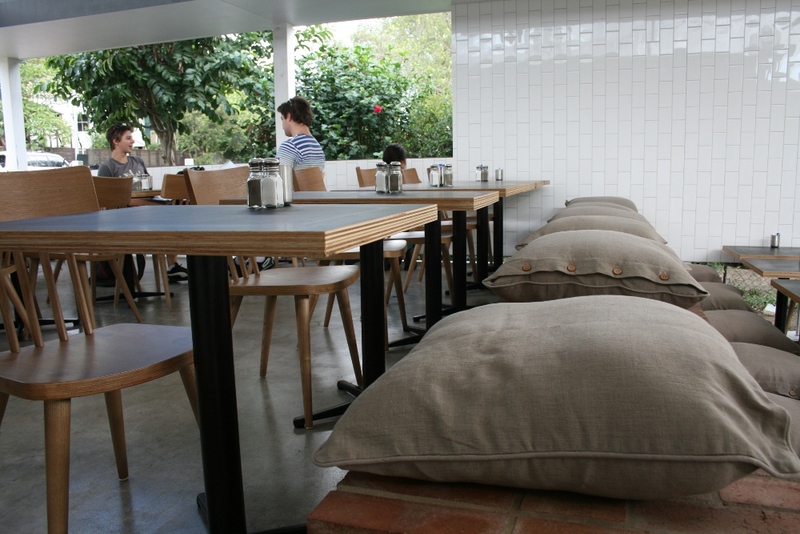 Bunker is a great addition to the Brisbane coffee scene and has already become the talk of the town. I’ve decided to make use of my new Samsung Galaxy S that shoots 720p hd video and have used this review to be my first video in one of my reviews so here is a look at a double shot latte being poured at Bunker. location: 21 Railway Terrace, Milton Qld. When owner Josh Russell decided to open his own cafe / roastery this past January it quickly became clear that Cup would become one of West Ends top specialty coffee spots. Fast forward seven months and Cup Specialty Coffee is now a well known hot spot on the ever expanding Brisbane coffee scene. Josh roasts his beans in house on a 5 kilo probat and always has two grinders running to keep things interesting. 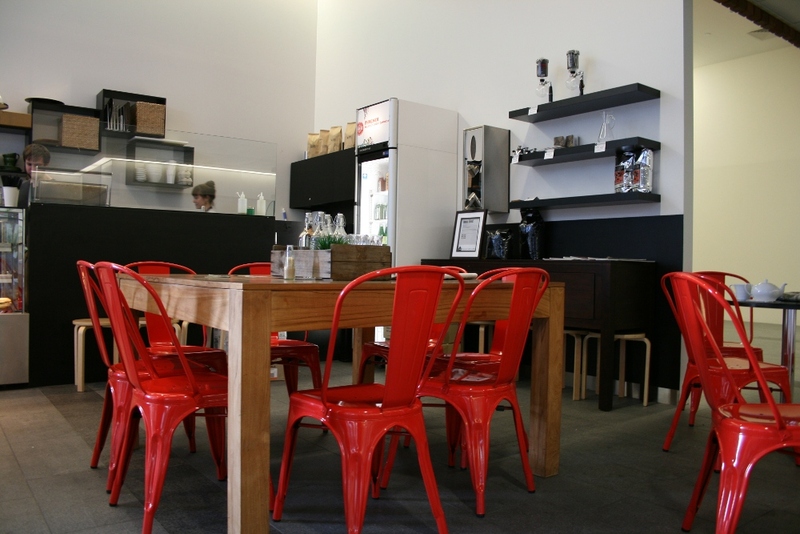 Have you been to Cup Specialty Coffee? Join in on the discussion and tell us what you think. Location: 85 Russell Street, West End. Check out this awesome video from the team at PSN Creative .. I was blown away the first time I watched this. Ok I know this is BNE COFFEE aka a Brisbane based coffee blog but this past July I was in New York for a few days and in our travels I stopped at a few different cafe’s .. most of which I was not impressed with. In fact the worst espresso I had was in Little Italy. Then on my last day in the big apple I was getting ready to give up on finding a decent coffee when I stumbled upon Macchiato Espresso Bar in midtown. After all the bad experiences I nervously entred to what was a surprisingly very cool modern vibe. I had ordered a piccolo and was amazed at how good this coffee was. The service was fast and the staff were very friendly. They seemed to attract the business crowd but there were a few tourists lurking as well (inlcuding me). I loved the whole look of the cafe. It was bright, modern and classy and it fit perfectly into its midtown location. 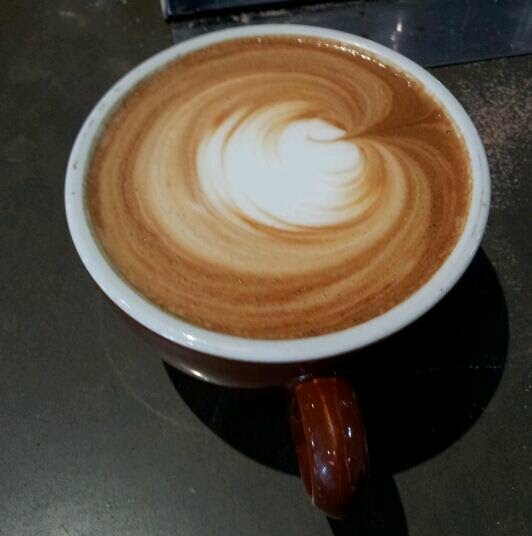 You’ll find Macchiato Espresso Bar a few blocks east of grand central station on 141 East 44th Street. 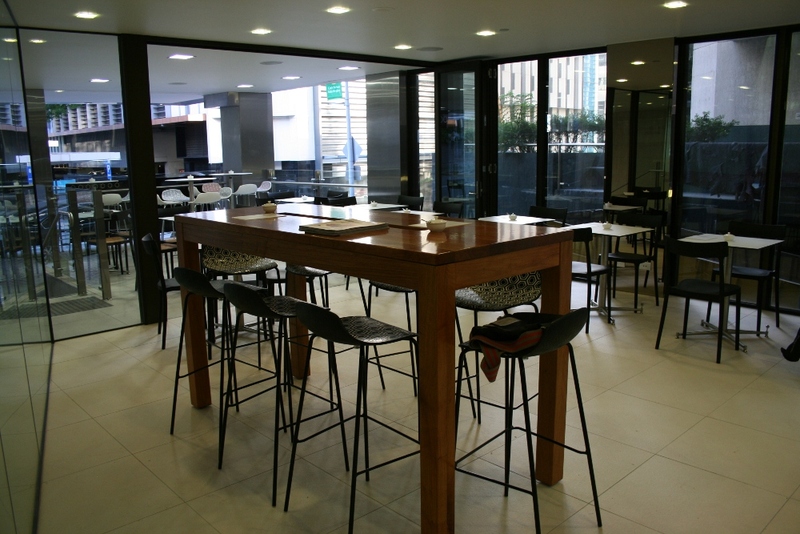 One Drop Specialty Coffee is located at the base of the Cardno building / Green Square on St Pauls Terrace in Fortitude Valley. 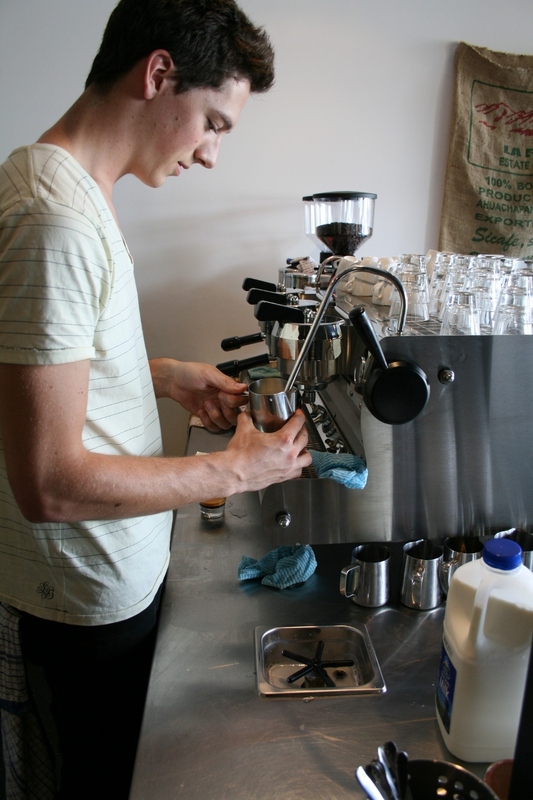 Owners Ben Graham and Blaine Swanborough are seriously passionate about coffee. 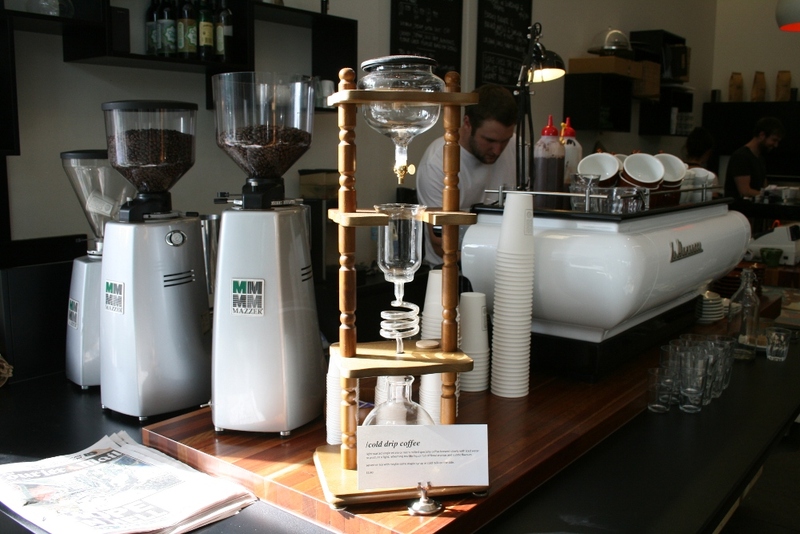 One Drop sources its coffee from Wolff Coffee Roasters Brisbane. One Drops new house blends origins are Indian / Columbian / PNG and Brazilian. 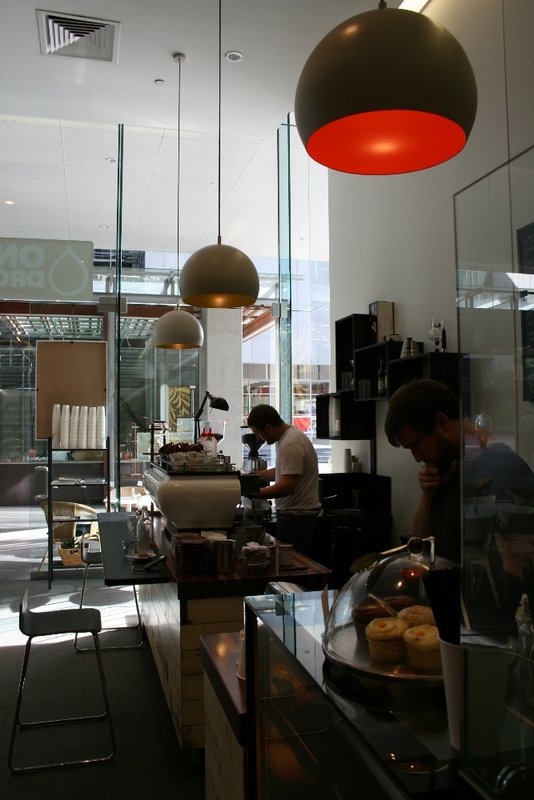 Its been interesting watching One Drop grow over the past year and they are without a doubt one of the top specialty coffee shops in Brisbane. Quality control is very high here and the staff are super friendly. Since opening its doors last week I have watched it get busier and busier as office workers and locals catch on to this hidden gem. Having lived and worked in the valley area I can tell you that there are plenty of cafe’s but very little decent coffee. One Drop is already standing out in the crowd as one of the serious coffee spots in Brisbane so if your in the valley make sure you drop in. Just don’t sit on the stool in the corner .. thats my seat! Before you go check out the awesome video below that was produced for One Drop. Directed, shot & cut by The Brothers Graetz. 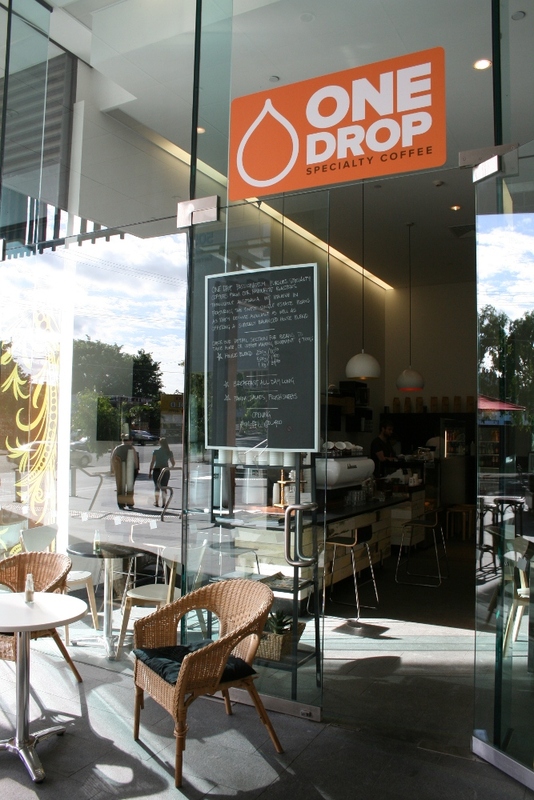 Have you been to One Drop Specialty Coffee? Click on the discussion link below to tell us what you think. I’ll be posting random micro blogs to this twitter feed whenever I am out at a cafe. When the former owner of one of my favorite cafe / roasters (caffeine espresso) decided to open up his own roasting operation I had high expectations. When I sat down with owner Mark Pearce and a few other espresso addicts for some sample shots of his new espresso blend “re:hab” I was blown away. Seriously, it was the best kick in the face double shot latte I have ever had. The standard of quality in this blend alone has raised the bar of what I consider a quality cup of coffee.